There are a range of wheeled bags on the market that are used for different purposes. Lawyers are well known for wheeling their documents around in briefcases trolleys. Anyone who has to transport documents, sports equipment or any other objects can save their backs by using a wheeled bag. 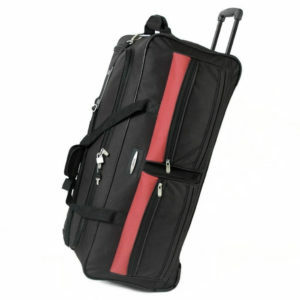 Many suitcases now have wheels on them so that people do not have to risk their backs carrying heavy bags. Different names are used for bags on wheels some may be called holdalls with wheels while others may be referred to as weekend bags. Bags that are designed to be the size allowed for use as carry on for airlines may be labelled cabin bags. The bags available range in the quality of material and structure used. Depending on what the bag is going to be used for it may be advisable to buy a stronger sturdier bag to avoid stitching being forced loose by pressure of the contents. Some bags will come with a guarantee and manufacturers may be willing to send spare wheels to the consumer as they are committed to gaining or maintaining a reputation for quality. This Jeep holdall is made up of different thickness material giving it strength in some places and flexibility in others. Being 120 litres it is as large as some suitcases at could be used as such. However the height and width would be closer in most suitcases, making them easier to move. This type of bag may be unsuitable for someone with limited strength to manoeuvre it. The bag has extra storage pockets on the outside of the bag for easy access. This holdall has plenty of room for sports kit, documents or as a weekend bag. It is made of strong materials which are guaranteed for 5 years. Features: Lightweight, 3.3kg, telescopic handle and 2 wheels. Large size: H87 x W38 x D36 cm. Cabin luggage is luggage which can be carried on board with the passenger at no extra cost. Some airlines allow hand luggage that goes under your seat and this is different from the cabin luggage that must fit in the overhead locker. 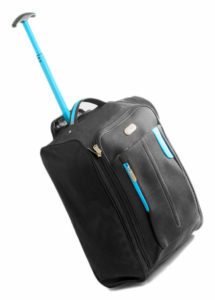 This bag by InTravel is suitable for use with EasyJet, KLM, Air France & Ryanair, Virgin and many more. It is however just as suitable for use as a weekend bag, or for everyday transport of documents, sportswear amongst other uses. Made from a lightweight material this bag has 2 wheels and is easy to transport. IATA Airline industry approved cabin size: This bag will fit the 55x40x20cm cabin restrictions given by 95% of the airlines. This easy to use cabin bag has the advantage of weighing just 1.5kg making it suitable for children and adults alike to use for going on holiday or for everyday use. Features: Lightweight, suitable for use as cabin luggage on 95% of airlines, durable material. With a hard shell this 18.5 inch cabin approved luggage has the advantage of offering some protection to fragile items you have packed. This case also has 4 wheels providing the case with a high degree of mobility as well as meaning that it can balance on its wheels. 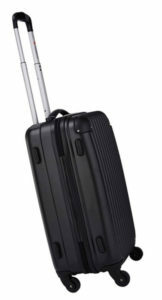 The 18.5” size is cabin-size luggage meets the IATA recommendations and can be taken on board an aircraft. TSA lock allows security to open your bag without the combination. Comes in 6 colours: Black, Grey, Purple, Rose & pink, Blue & rose, Lavender& Green. These lightweight hard suitcases are made from tough ABS hard plastic shells that give a unique combination of strength, flexibility and lightness. This hard shelled cabin bag has the advantage of being tough enough to deal with being transported around airports and anywhere else that the user needs to move things around with ease. It benefits from having 4 wheels that spin smoothly and can be balanced on itself whilst not on the move. Features: Lightweight 2.8kg, hard shell, telescopic handle, approved for use in cabin overhead locker on 95% of airlines, durable material. For transporting bulkier everyday items such sports equipment or for using as a travel bag the Jeep Official Large Wheeled Bag offer excellent value and a good quality bag that takes out the risk of back injury from carrying around large loads. It has a 5 year warranty which speaks for the confidence that Jeep have in their product. For the smaller load, specifically for taking a walk on cabin bag onto an airline or generally for carrying around items such as folders, books and gym clothes, either the InTravel Cabin Bag Hand Luggage Suitcase or the Travelhouse 18.5 inch Cabin-approved hard suitcase offer great value and convenience.